It has been a few weeks since Project Discovery (PD) was launched and it quickly became a talking point within the EVE community, spawning a range of both memes and discussions. But it is no secret that there have been some issues, some of which were discussed by Ashterothi in his article about the project. Both CCP and Human Protein Atlas (HPA) are fine-tuning the system, but one of the issues still remains: many players don’t have a background in biology so can get easily confused by what they are looking at. This article strives to resolve this by diving into the underlying science. The project is known as the HPA and the goal is to map the proteins of the human cell according to their location. Proteins are one of the key components of life and serve many functions ranging from enzymes to signal molecules and structural components. The function of a cell is defined by how the DNA is expressed, and this DNA is then translated to proteins where different cells have different expression of proteins depending on their functions. For example, liver cells have a high amount of enzymes since one of their main functions is metabolism. However malfunctions, one way or another, of these proteins are often the cause of many disorders. Type 2 diabetes is caused by cells being resistant to the important signal protein insulin, thus creating the need for extra insulin from an external source. Thereby proteins are often the target of most drugs. However the function and spread of most proteins is still unknown so most drugs are often too unspecific which creates unwanted side effects. The purpose of HPA is to map the proteins so more specific target proteins can be found in order to create better medicine. And by the cooperation between CCP, HPA and Massively Multiplayer Online Science (MMOS) we are able to contribute to this. Crowd science is a great method of tackling a large project like this since there hasn’t yet been developed an AI capable of recognizing the patterns of the samples and it would take too many resources if all of it had to be done by scientists. One of the things I have learned about EVE players is that we like to make the computer do the boring work for us and if one day one of you develops an AI that can farm PD for Analyst Kredits we will see a major breakthrough in the project. At first the samples may look like something computer generated. At least that was my first thought when I was presented with a sample that has been stained with immunofluorescence. The samples are from human cell lines, which are cells that are extracted from the human body and then grown in a lab. This gives easy access to a large amount of cells that are genetically identical. The cells are then stained in order to easily identify the different structures in the cells. 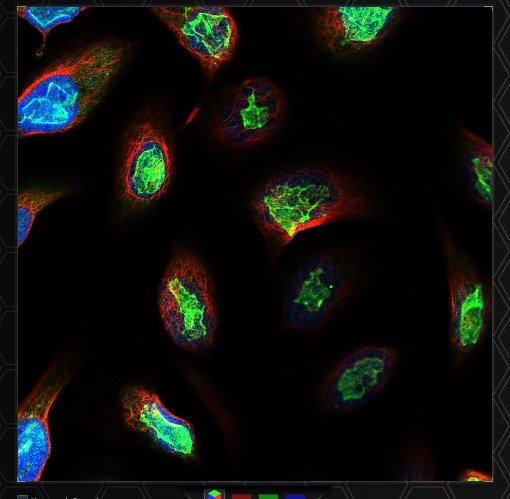 The immunofluorescence staining method makes use of antibodies that are made to target specific proteins. Antibodies are a vital part of the immune system and are normally produced in the body in large quantities. They attach to the pathogens and make it easier for the immune system to target and eliminate them. Think of them as the fast tackle frigates of the immune system. In immunofluorescence the antibodies are coupled with a fluorescence molecule that will emit light at one wavelength when illuminated with another one, hence the term immunofluorescence (I swear this is the last time I use that stupidly long word in this article). In PD three different colours are used: green is for staining the protein of interest, blue is for the nucleus and finally there is red for the cytoskeleton which is the structural component located in the cell, but outside the nucleus. Thereby the red and blue colours serve as reference points when studying the sample. The images are taken with the use of a fluorescence microscope, which is capable of emitting and detecting the relevant light wavelengths. The images themselves are 2D slices of the cells taken in a process where a suitable plane is manually found. This does once in a while create hiccups where samples like this famous one pictured above are created. HPA Illuminator explained to me that it was most likely a capture of a plane where residual stain was found above the cells. What are all these structures? Like the human body has different organs with different functions, the cells have their own organelles which likewise have different roles in keeping the cell functional. And by mapping which proteins are associated with which organelle it can give us a great indicator of the function of the proteins. In PD they have been divided into three different categories: nucleus, cytoplasm and periphery. Nucleus: The entire nucleus. This option should only be taken when the nucleus has been stained sufficiently and is clearly brighter than the surroundings. You should be able to easily spot the nucleus with only the green filter on. Nucleoplasm: The general substance of the nucleus minus the nucleoli. The criteria for nucleus apply here as well, but there are clear holes that overlap with the holes in the blue filter. Nuclear membrane: The membrane that separates the nucleus from the rest of the cell. It is seen as a clear ring around the nucleus. Nuclear bodies: No-one yet has a clear understanding of the function of nuclear bodies. They are seen as bright dots in the nucleus. Nuclear speckles: The nuclear speckles are clusters of substances involved in the processing of RNA. In the samples they are seen as diffuse structures in the nucleus. Nucleoli: The nucleus contains one or more nucleoli which are the production sites for ribosomes that are used to produce proteins. The nucleoli are seen as clear structures that overlap with the holes in the blue filter. As for the nucleus, the nucleoli are separated by a membrane that likewise can be seen as a ring. Some samples also contain the fibrillar center of the nucleoli which is a cluster of enzymes that are seen as diffuse green structures in the nucleoli. Cytoplasm: The general substance of the cell and the general choice of EVE players. However it should only be selected if it is clearly stained and with the green colour visible with all filters on. So don’t just cytoplasm it! Mitochondria: The mitochondria is the powerhouse of the cell. They are seen as long “spaghetti-like” threads spread throughout the cell but tend to be denser close to the nucleus. Aggresomes: Aggresomes act as a trashcan for misfolded proteins if the cell isn’t capable of breaking them down fast enough. They are seen as concentrated clusters near the nucleus but can spread out and become a bit more diffuse. Additionally they overlap with holes in the red filter. Rods and rings: Little is known about these but at least they look like rods and rings. Endoplasmatic Reticulum: The Endoplasmatic Reticulum (ER) is the site for synthesis of most proteins but also some type of fats. It is connected to the nucleus membrane and the inner part of the ER is more dense while the other part has are ‘spiderweb’ structure. Golgi apparatus: The Golgi apparatus is responsible for modifying and processing proteins and fats from the ER and also acts as a sort of distribution center. It is a diffuse structure located near the nucleus. Vesicles: Vesicles are packages of enzymes or other substances and are used for transport of these either in between the organelles of the cell or uptake or release into the outside of the cell. They are seen a clear circular structures that are spread throughout the cell. Centrosome and Microtubule organizing center: The microtubule organizing center (MTOC) is the central point for microtubule growth. The centrosomes are the central anchor of this structure and each cell contains a pair of these which is often clearly visible on the samples as they are seen as two green dots. The MTOC on the other hand looks like a cluster. Both are located near the nucleus (sometimes ‘on’ it) and often on an intersection of the fibers on the red filter. As the name implies, the cytoskeleton is the skeleton of the cell and therefore forms the structural base of the cell. Actin Filaments: Actin filaments are long fibers located near the plasma membrane. They are the fibers that give the cell its shape. Intermediate Filaments: While the actin filaments are responsible for the cell morphology, the intermediate filaments give it structure and hold the organelles in place. The number of intermediate filaments can vary substantially in cells which can be seen on the samples, ranging from a low amount of fibers near the nucleus to interconnected fibers spread through the entire cell. Microtubules: The microtubules are the structures stained on the red filter thus giving a yellowish colour when the green and red aligns. They act as a transport network for vesicles. They all start out from the MTOC. Microtubule ends: As the name implies they are the ends on the microtubules and serves as a cap to prevent unwinding of the microtubule. They are seen as long ‘rods’ that overlaps with the red filter. Cytokinetic bridge: The cytokinetic bridge is the last part of mitosis (cell division) where the connection between the two cells dwindles and finally gets cleaved. It is seen as two green spots located on a red ‘bridge’ between two cells. The periphery category includes the plasma membrane and structures located on the membrane. Plasma membrane: The plasma membrane is the ‘skin’ of the cell and thereby presents as a barrier between the outside and the cytoplasm. Several types of proteins can be located on the membrane and are used to interact with the outside. On the samples it can look differently but is mostly seen as a rim around the cell. However it can have protrusions into the surrounding area and it can sometimes be hard to distinguish from the cytoplasm when some of the membrane from above or below the cell is visible on the sample, the main difference being that cytoplasm doesn’t extend outside the cell as well as the lack of a bright rim. Focal adhesions: Focal adhesions are used by the cell to attach to the surroundings and are often located at the ends of actin filaments. They are seen as elongated structures often perpendicular to the membrane. Cell junctions: Cell junctions are structures that form connections between cells. These can be either structural or signal connections. Sometimes they are a clear structure seen along the entire border between two cells and other times they are more dotted and diffuse. But while focal adhesions are spread along the membrane these are mostly seen in between cells. I hope this article has given a better understanding of what you are looking at. Maybe it has also given you more motivation as well. It is certainly interesting for me to see the connection between games and science and who knows what could be next. But allowing players to actively contribute to real science while having fun instead of ship spinning is something CCP could increasingly take advantage of in the future.